4. Flour starch, takarannya tailored to the taste, because there is a feeling like the taste of meat Baso with a stronger tepungnya about 3-4 tbs, or there is also a term like Baso village, with tepungnya measure about 1 1 / 4 - 1 1 / 2 cup, so basonya feels spongy. 1. When you want a smooth texture that Baso, beef and chicken again grinding the food processor until smooth. Baso turvy want the texture is rather coarse / Baso no grinding grain again. So although we do not have food processorpun we can still make a lawful Baso. 2. Mix all ingredients, and then poke through the dull, with the can hands, or if the mixer has a dough also can be confused with the tool, if somewhat hard adonannya, Mix a little water. 3. 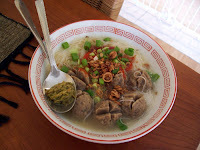 Boil a pot of water, after boiling, lower apinya, enter Baso dough that is dipulung, if already baso float, this was ready. Dinginkan and can store in the freezer.